Parents, are you looking for fairy crafts for your little fairy princess? How about free printable Tinker Bell, Barbie Fairytopia, Fairies of Pixie Hollow and Rainbow Magic fairies? Start with Rainbow Magic fairy stories created by a collection of authors writing under the pseudonym "Daisy Meadows." Rainbow Magic is illustrated by Georgie Ripper. There are several dozen Rainbow Magic fairy stories. Here are free printable Rainbow Magic fairy crafts. The series began with the Rainbow Fairies, seven sisters each named after a color of the rainbow: Ruby, Amber, Saffron, Fern, Sky, Izzie and Heather. 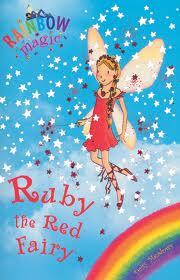 Two little girls, Rachel and Kirsty discover the rainbow fairies and their magical kingdom. The Rainbow Fairies series has blossomed to include fairies for practically every theme: princess, jewel fairies, pet keepers, weather, fun day, sporty, Christmas, flowers, music, magic animals, dance, party, ocean, green, twilight and several other fairy groups. Start your free printable Rainbow Fairies activities quest here. The Friendship fairies offers free printable friendship activities, fairy crafts, puzzles and word games. The Green fairies are all about the environment and keeping the earth healthy. Visit the Green fairies page for free printable fairy crafts, activities and games and Rainbow Magic free printable picture frames, post cards, stationary, puzzles, word games, door hangers and coloring pages. Here are free printable coloring pages of fairies from literature such as Shakespeare. There are old school Tinker Bell images and pictures of the Blue Fairy from Pinocchio. Here are more free printablefairy princess crafts and Medieval fantasy crafts with fairies. Here are free printable Barbie Fairytopia coloring pages. And you can't let an article about fairy crafts go to print without a nod to the greatest fairy of all Tinker Bell! No, don't get mad Tink, because the best is always saved for last! Here are free printable Tinker Bell and the Fairies of Pixie Hollow coloring pages. Print a whole booklet of Tinker Bell, Barbie Fairytopia and Rainbow Magic activities to occupy a sick child or pass the time on a family car trip. Pack her a "Care-y Fairy Package," including printable booklet, crayons or markets, stickers, scissors, glue sticker and pencil. For extra fun, add some glitter (fairy gurus often refer to this as "pixie dust.") By the way, June 24 is Fairy Day!